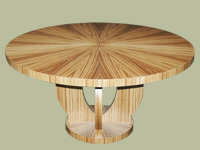 This Zebra Wood Dining Table was designed for a Philadelphia Client. They requested a round contemporary style table for their Breakfast Room. 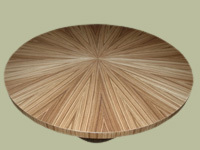 The Table is 6’ in diameter and fabricated of Zebrawood Veneer with the top done in a “sunburst” pattern. 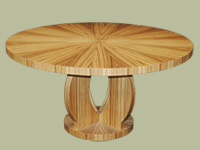 Finished in a clear low sheen conversion varnish finish this is a very elegant and easy table to live with.